The Cape Town edition of the Blockchain Africa Conference 2019 saw an exploration of how blockchain technology has and can be used to help achieve the United Nations’ sustainable development goals. Speakers explored the ways in which this emerging technology is combating issues of security and safety. There is a shift moving from private and centralised systems to more public, anonymous, decentralised networks in a bid to maintain safety and security over financial assets and data, and in order to keep up we need to look to technology to make important changes. Enjoy the highlights video of the conference in Cape Town. The presence of provincial government executives was enthusiastically welcomed by an audience made up of tech geeks and “blockheads” as Premier Zille so affectionately labeled us. The elegant and unequivocally eloquent Didi Sehume was the master of ceremonies and addressed the audience with the welcomes and the formalities. Minister Beverley Schäfer opened the Cape Town conference with a thoroughly well-researched and educated address outlining what is truly possible for our economies in the likes of real estate, medicine, and of course finance, with the introduction of blockchain. Her keynote was presented with passion and a sincere desire to see economies impacted for the better through innovative solutions such as blockchain technology which included a statement: “We would likely find a way that blockchain can reduce costs, or increase speed transparency and traceability.” SA Crypto’s podcast interview with Minister Schäfer highlights the need for innovative tech like blockchain, and the need to support technology-centred entrepreneurship in the Western Cape. Minister Schäfer’s address was followed by the headline act, Premier Helen Zille who presented her address using handwritten notes based on her very own research. Premier Zille’s passion for blockchain’s possibilities was obvious in her address: “We haven’t even got our feet wet yet. 10 years from now, blockchain will be mainstream. How do we prepare for that?” Zille was not only captivated by blockchain, but she was also captivating in that she had the attention of her audience through her heartfelt call to the industry: “This is truly a disruptive innovation that opens entirely new possibilities for governance.” SA Crypto had an interesting podcast interview with Premier Zille about how she first came to hear about blockchain, and how the Western Cape provincial government could potentially see it implemented into their administration. Winslyn TV featured both Premier Zille and Minister on what the Mother City planning with blockchain technology. The conference continued with talks by the incredibly articulate Jean Paul Fabri about Malta’s preparation for this new wave of innovation, and its resounding success in drafting progressive regulation that attracts innovative startups. Learn more from Jean Paul, with his podcast interview by Grey Jabesi, on How Malta became the Blockchain Island. Panels with blockchain and economic expert Farzam Ehsani and Centbee’s Lorien Gamaroff made for locked-in attention as it addressed cryptocurrency adoption in Africa. Monica Singer’s story of leaving the elite of corporate South Africa for blockchain powerhouse ConsenSys is an inspiring one, while Matthew Arnett’s panel contribution to Economic Inclusion in Africa utilising blockchain innovation highlighted what is happening right here on the African continent. Grey interviewed Matthew Arnett on P08’s work in Marine Archaeology on Blockchain with STO. 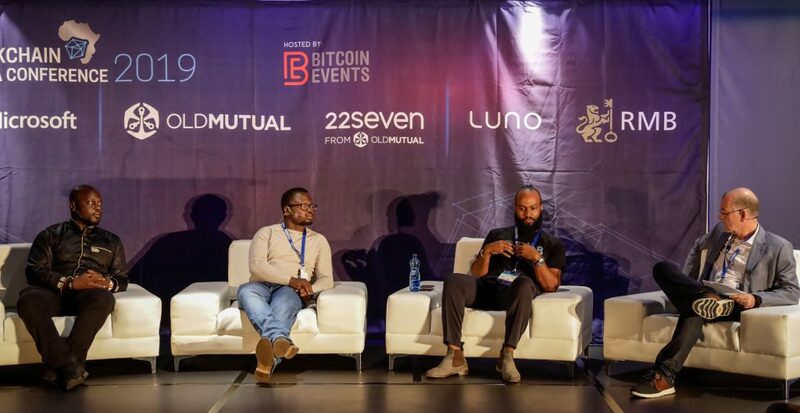 The conversations and introductions made between key government officials and leading technologists, engineers and entrepreneurs in the space were ones that will be invaluable to South Africa’s adoption of blockchain, crypto and distributed ledger systems. View photos and receive more information on what happened at the conference in Cape Town on the day on our website. Videos of the conference can be viewed on Bitcoin Events’ YouTube channel. Thank you to our sponsors, partners and exhibitors for helping make the conference a success. We are planning our next event! On this one day gathering in the latter half of 2019 in Cape Town, South Africa, we will explore the economics, investment, trading, trends, culture, technology and the future of cryptocurrencies. For more information on this and future events, please email the team at info@blockchainafrica.co. Subscribe to our newsletter to stay informed of our next events and news of the global blockchain and cryptocurrency industry.